Choosing the right type of FIBC fabric is the difference between success and failure in your manufacturing process. Fortunately, making that decision doesn’t have to be difficult. Selecting between Type A, B, C and D fabrics is based on your plant’s environment and your product. That’s where we like to help here at Conitex Sonoco. FIBCs are usually made from woven polypropylene and are coated with a synthetic film made of a polypropylene and polyethylene mixture to properly contain the product inside. You might be able to use a standard bag, as-is, but this won’t work for every industry. Here’s how to determine the fabric that best fits your needs. Type A bulk bags are made of polypropylene, calcium carbonate, and a UV additive to protect against and prevent erosion if they are stored outside. If you ask for a standard bag that's the fabric that you're going to get. Type A bags are used to transport non-flammable products and have no static protection or special electrostatic safety features. Because of this, these bags should not be used for combustible materials or in flammable or combustible environments. Type B bags are made from standard polypropylene material just like Type A bags. What makes Type Bs different is how they prevent sparks. The polypropylene develops a static charge when someone brushes against it in a dusty environment creating a spark. A spark in the wrong environment leads to an explosion. Type B bags don’t spark. These bags have a dissipate or anti-static coating to prevent a disaster like an explosion. Type C bags, or conductor bags, are woven carbon filament that you have to ground whenever you’re filling or moving the bag. The bag must be grounded in order for it to be used safely. Type C bags are used to safely transport flammable powders. They are used safely when flammable solvents or gases are present around the bag. These bags are most commonly used by chemical companies and other industries like the resin industry and some agricultural industries. 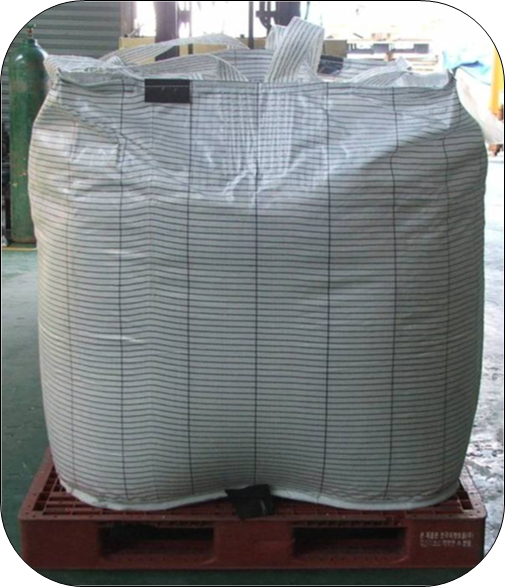 Type C FIBC bags are used to transport is highly flammable material. Type D bulk bags are also called antistatic bulk bags. This means that, similar to the Type C conductor bags, these bags are made from antistatic fabric that prevents sparks however, they don’t require grounding. The fabric used in these bags is completely static dissipator, meaning it automatically dissipates the static charge in the atmosphere, rather than gathering it all up and causing a spark. These are used to transport flammable powders. It can also be safely used with flammable solvents or gases around the bag. Do not use when the surface has water or grease on it. Do you still need help choosing? If you’re still unsure about which bag is right for your process, ask your vendor, especially if you have a new product you are packaging for the first time. Use your Material Safety Data Sheet (MSDS) to inform what packaging products you need based on what you are trying to transport. Your MSDS will tell you the minimum ignition energy of your product. Based on the minimum ignition energy, vendors can then recommend a fabric. 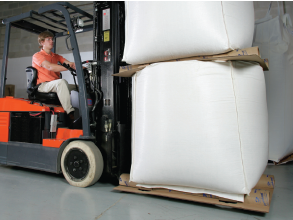 If you have any questions about choosing the right type of bulk bag for your product, feel free to reach out to our BulkSak® team. BulkSak® is our inhouse FIBC bulk bag brand that offers a broad selection of FIBC products along with a domestic and world-wide manufacturing network.